Roland' s Ultimate Keyboard Amp. The KC-550 and KC-350 include Roland’ s Stereo Link feature for chaining two amplifiers. Using a single cable, you can connect two KC amps for true stereo sound while controlling them both from the amp nearest you on stage. Want more low end? 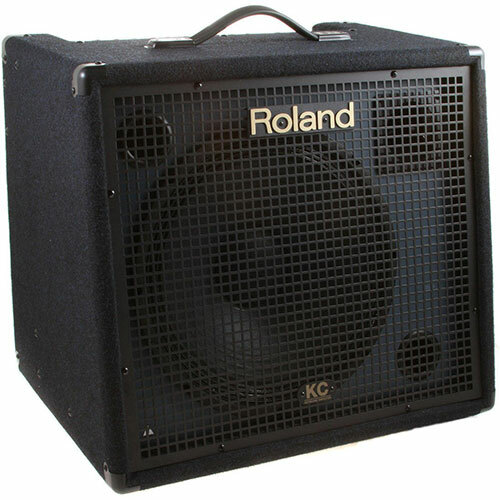 Simply add an optional subwoofer like Roland’ s new KCW-1. Connections are easy, thanks to the Subwoofer output found on all new KC amps. Now even the most affordable models can sound huge! KC amps are built for life on the road. All models have built-in handles for easier transportation ( the KC-550 also includes casters) and a rugged design with heavy-duty carpeting, protective edges and an all-metal grille. This drumset would look great on stage or in a bed room/practice space. These gig makers are legit for sure and really set the pace in the affordable drum market. Unlike many other lesser drums,this drumset features MATCHING WOOD BASS DRUM HOOPS among other great features. As a regular feature of a club sound system or as a durable road piece the S-Direct is the only direct box you'll ever need.